My FAVORITE crystal color in tumbler form! It takes over 7 different glazes to get this effect and it's completely worth it! Grey Opal (second photo) is featured with cooler tones (no orange or yellow), and a matte grey background. Please Note- White Opal and the Opal background glaze are not the same. Opal is a satin peachy-pink glaze where as White Opal is a gloss mixture of 7 glazes. "Lead Time" is the time is takes me to create your order from start to finish. Quoted lead time does not include delivery time as I have no control over mail systems. "I don’t live in the US and am concerned about a fragile ceramic piece shipping a great distance. Would my order arrive safely?" I have safely shipped over 1,000 pieces internationally for over two years now. I ship pieces using double-corrugated cardboard boxes, biodegradable packing peanuts and sturdy bubble wrap. I package pieces to withstand a 5 foot throw as recommended by USPS. I have spent a great deal of time and energy making your piece and you have patiently waited for your purchase- I am as invested in your piece arriving safely as you are. 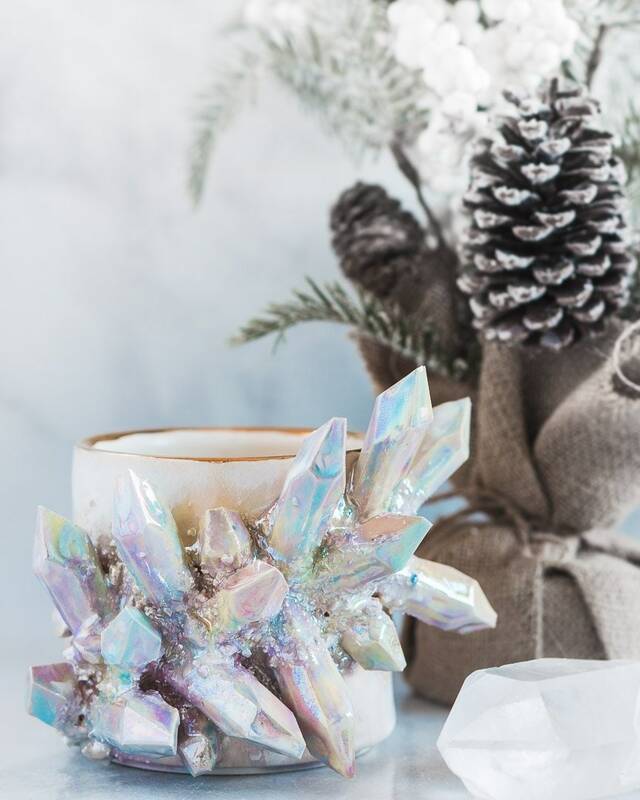 "Can I actually use the Crystal Mug/Tumbler to drink out of or is it solely decorative?" My Crystal Mug/Tumbler is fully functional. I include detailed care instructions with every piece and also have the care instructions on my website (essaraiceramics.com) in case they are misplaced. They are not microwave safe and I recommend hand washing. "Can you make the crystals smaller or do a different design than what you currently offer?" I was inspired by large crystals and my sweeping formation has now become signature to Essarai Ceramics. As an artist, I believe it’s important to stand apart and offer a different perspective on a genre which is occupied by several other artists. "I’m afraid of an injury using one of your pieces; should I be concerned?" I offer multiple perspectives of my work on Instagram as I’ve received comments that may imply ones eyes could be injured utilizing my work. These perspectives serve to show that the crystals are strategically positioned to angle away from the face and are not vertical. This was something that I was aware of when I designed my collection and have never experienced an issue with someone injuring themselves using one of my pieces. "Your work is very expensive. Do you have sales?" From the start of my business, my goal has always been to share my art as fairly as possible; I have to make a living and pay bills (student loans!). I’ve spent many nights going back-and-forth with my pricing structure, looking at what other artists sell their work for and ultimately feel that I am offering the best price for my work. I offer an array of different pieces that span a large price range; I believe that everyone deserves to be surrounded by inspiration and beauty. As a small batch artist, I do not offer sales as the supply costs and energy that goes into every piece remains the same. I do however offer a discount coupon for individuals who take the time to leave a written review on my Etsy. Ahhhhh-may-zing!! I couldn't be more in love with my gorgeous piece of art!